In an interview with ABC, Trump said the image was "such an innocent picture." Trump also incorrectly claimed that the photo "was put out by my people," as it was released by Merkel's office. In an interview following the summit with North Korean leader Kim Jong Un in Singapore, Trump tried to downplay the photo's meaning to ABC's George Stephanopoulos. Trump said the group was simply waiting to see the final version of the official G7 communique, a largely symbolic statement about the progress made at the summit. "She was looking at me, you know what we were doing?" Trump said of German Chancellor Angela Merkel. "We were talking while we were waiting for the final copy of the document. That was, that was such an innocent picture." "I left, everybody was happy, everybody shook," Trump said. "You should ask Prime Minister Abe. Everybody was happy." 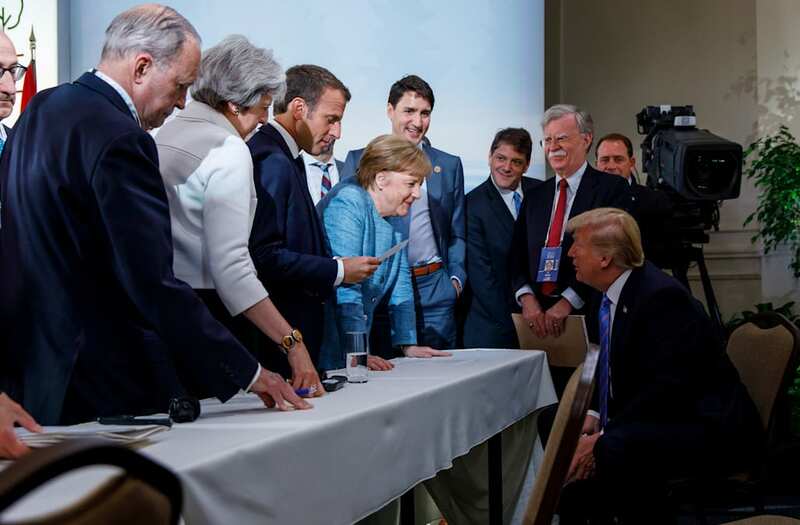 The decision to remove the US from the communique set off a strong response from other G7 leaders. Merkel called Trump's decision "sobering and a bit depressing," and Macron also offered a strong rebuke. "International cooperation cannot be dictated by fits of anger and throwaway remarks," Macron said in a statement. "You know, we put out that picture. That was put out by my people," Trump told Stephanopoulos. The image was first released by Merkel's spokesman, Steffen Seibert, and was taken by the official German government photographer Jesco Denzel.